You are safe from harm." 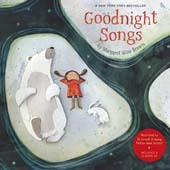 From Margaret Wise Brown, author of the beloved Goodnight Moon, comes a previously unpublished collection of charming lullabies, gorgeously illustrated by 12 award-winning artists. The roster of celebrated names includes Carin Berger, whose The Little Yellow Leaf was a New York Times Best Illustrated Children's Book; Eric Puybaret, who brought the bestselling Puff, the Magic Dragon to life on the page; Coretta Scott King Honor Award winner Sean Qualls; and Caldecott Honor medalist Melissa Sweet. An accompanying CD, with lilting songs beautifully composed and sung by Emily Gary and Tom Proutt, makes this the perfect gift to wish children a sweet goodnight.